Welcome to Katfrog's Corner: Movie Review: "The Dark Knight Rises"
Holey Moley, Batman! What a movie!!! Okay, I grew up watching the corny Adam West Batman TV show, where I learned to love the Caped Crusader. I mean, here's a guy who doesn't have super powers, hasn't altered his DNA or genetics through a scientific experiment, and doesn't have special government spy training. But Bruce Wayne takes on crime intelligently, using his brain power to out think the bad guys while sporting cool Bat technology. Plus, the show helped the phrase, "Holy cow!" become famous. I watched all the Batman movies, starting with "Batman" in 1989. I love the ones with Michael Keaton and I try to forget all the others. Actively try to forget, that is. But then came "Batman Begins", and Christopher Nolan hooked me into the series again. From Bruce Wayne falling down a well to how and why he became Batman, Nolan took the Batman legends and stories, then crafted a trilogy that balances the darkness of Gotham and the human spirit with the hope brought by Batman and (strangely enough) the human spirit. In an era of badly-done remakes and poorly planned sequels, the Nolan Batman trilogy exceeds all expectations to rise above the crowd, each movie fitted together like a hand-crafted wooden puzzle. 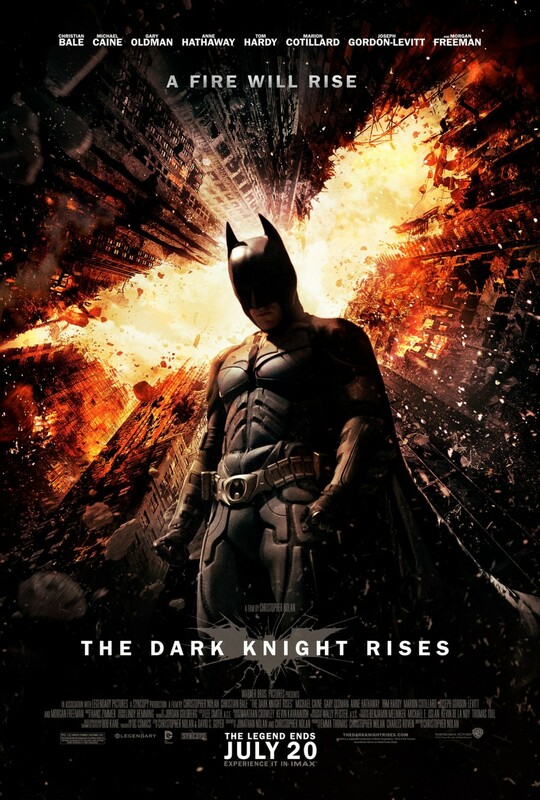 Okay, enough gushing about the Batman trilogy, and on to reviewing the final movie, "The Dark Knight Rises". The movie begins eight years after the last one ended. Bruce Wayne stopped appearing in public as Batman, opting instead to be a recluse in Wayne Manor. Alfred still works there, tending to Bruce's needs and acting as his interface to the world. I will not say more about the plot of the movie, but you can read a great plot description here at IMDB. What I want to talk about are the other parts of the movie. The acting surpassed by general expectations. I knew that Christian Bale (Bruce Wayne) could portray both anger and brooding well, but I was surprised at his emotions during the movie. Anne Hathaway (Selena Kyle/Catwoman) stole the show as a martial artist/thief/realist, a multi-dimensional character that was so believable I forgot it was Ms. Hathaway before the movie was half over. But Tom Hardy, as the veritable Bane, vibrated with calm destruction, a certainty about himself and the world that gave me goosebumps, since that certainty included a knowledge of how evil people will be given the proper circumstances. Other than the actors, the special effects enhanced the movie without taking over every scene. The score helped create the environment for the movie goer, adding to the sorrow, the suspense, and the angst when appropriate. The dialogue sounded like normal conversations, never like a movie script. And the cameramen or director left out all of the new and annoying camera tricks that make me motion sick. For those who haven't seen it yet, I highly recommend you watch the entire Christoper Nolan Batman trilogy. It is definitely worth your time. I can't wait for it to come out on DVD (we Netflix everything)! I was just remarking to someone the other day that I was first exposed to superheroes via the Adam West Batman movies....totally cheesy fun. I didn't like the Keaton/Kilmer/Clooney ones, and didn't watch all of them, but I absolutely love the Nolan ones with Bale as Batman.